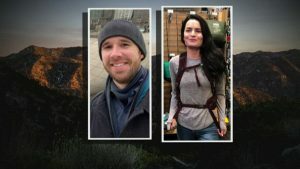 MOUNT BALDY, Calif. (KNBC) – Two California hikers who went missing over the weekend have been found alive and safe. 31-year-old Gabrielle Wallace of Rancho Cucamonga and 33-year-old Eric Desplinter of Chino Hills left Saturday morning for a day hike to Mount Baldy in the San Gabriel Mountains. When the two didn’t return Saturday night, a search was launched. After days of searching, the two were located Wednesday evening. A rescue operation was launched to get them off the mountain. The pair was flown to the Mount Baldy Fire Station for medical evaluation and to be reunited with family members. Appearing healthy, Desplinter spoke to reporters overnight and shared his gratitude toward his rescuers. “Thank you to all the volunteers that were looking for us. We are very grateful to be found tonight. I’m ready to get to bed and get some rest,” he said.